Spiritual Advice And Tarot Readings. 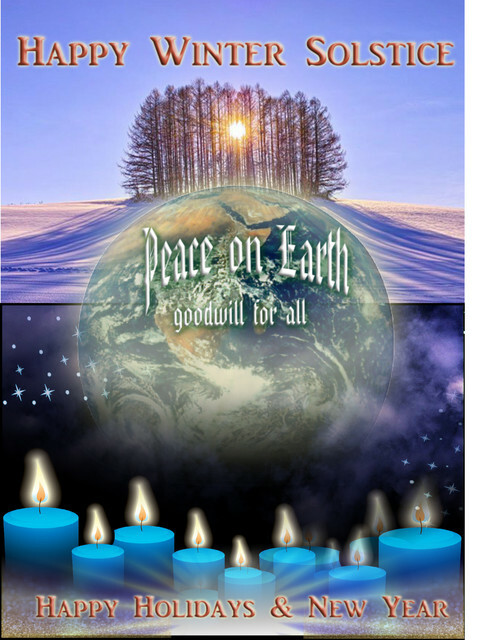 WE have the Winter Solstice late Friday eve and a Full moon on Saturday.. it is a powerful inner Earth Holiday... meditate during those days before and after if you can. I have been thinking a lot about you all here in the god light and wondering how you are all doing? I felt a pull yesterday to return/reconnect. So I popped in briefly but you were on my mind again this morning so I thought I should say hello. Ace I really really like that picture you have included. Would you allow me to share this with some of my friends? It has a very high visual and healing vibration and would dearly like to share it, with your permission. We have had a sad time just lately. My beautiful mother-in-law passed away. It was sudden and a shock but not totally unexpected. She had been fighting cancer for the past 14 months and we all knew she was terminal but thought we still had more time with her...but sadly that was not to be...and so on Tuesday the 16th of October at 6am she passed away in her sleep...she was only 62. Thankfully my husband managed to see her the day before she died and spent time with her. She was very philosophical about her approaching death and didn't fear it at all. She was just sad she was leaving so soon as she said she had so many things left she wanted to do. In one of our last conversations she said don't wait to enjoy life...life is here now...and NOW is the time...don't wait as you may run out of time. Anyway I just wanted to share with you. I hope you are all well and happy...I am good and happy apart from our family sadness. We we're prepared somewhat because we knew she was terminal...but still a shock in the end. No time to say goodbye or thank you. Anyway sorry I didn't mean to write so much. I just wanted to pop in to say Hi and Ace beautiful post and picture caught my attention. I will meditate today because I haven't done so in such a long time...and look forward to reconnecting with the Earth's energy and raising my own vibration. Peace love and light to you all. Hope her journey to life between life opening is going well for your mother-in-law.